This time of year took on a whole new meaning once we had Benjamin. Sometimes I feel bad that his birthday lands so near the holidays and the holidays aren't spread out a bit, but in a way, it's kind of fun! He gets to see and spend time with, nearly [if not all] of his family, and being together with loved ones is what it's all about! 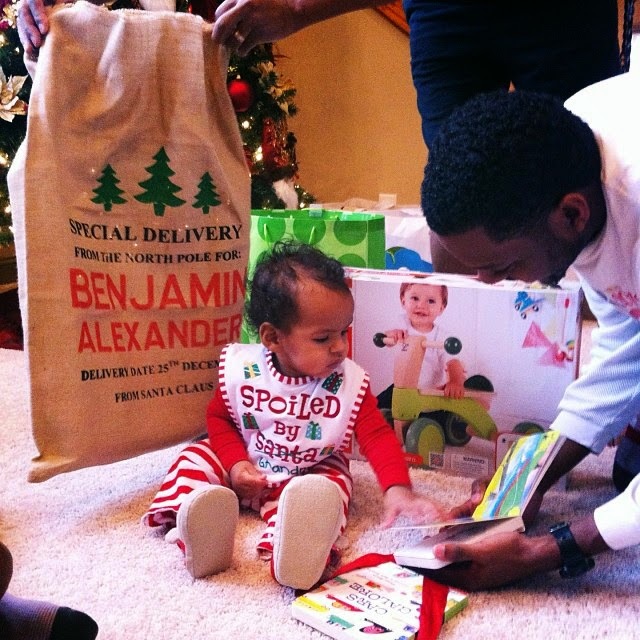 Benjamin was less than a month old when we celebrated his first Christmas. I was a walking zombie and it was a miracle we even managed his "First Christmas" ornament.We spent last year's Christmas in St. Louis, with my in-laws. Ben and I decided that we'd do one big Santa gift and I purchased this adorable personalized Santa sack from a shop on Etsy called, Silver Bobbin. 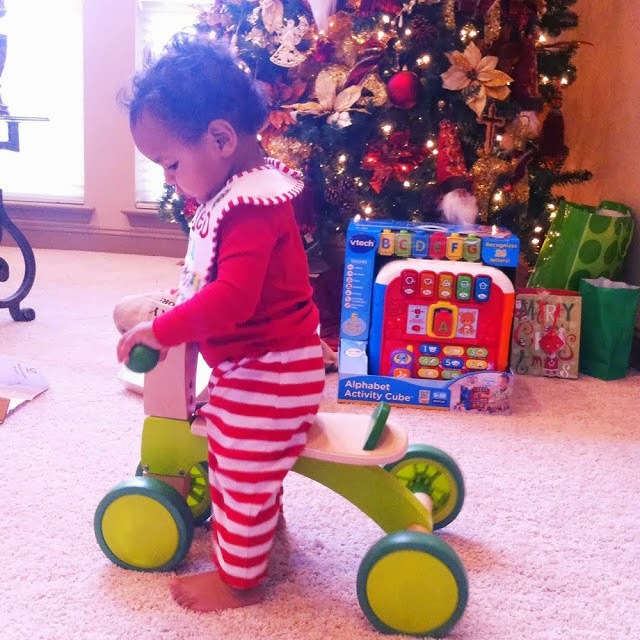 Last year, at [barely] one year old, we got him the Hape Scoot-Around. He didn't have the slightest idea what to do with it then, but over the last year it's gotten a TON of use. I was and am a huge fan of the look/design but it's a complete coincidence that we decided to go with another Hape toy this year! Originally, I was looking into creating a grocery stand for Benjamin's "Big Gift". Then, we were considering a train table. It was when we sat down last week for our family Christmas budget meeting and brainstorming sesh, that we saw this Hape Master Workbench. As I mentioned back in September, Benjamin is obsessed with tools! This is possibly, quite literally, the perfect gift for him this year. He will just die when he figures out what this thing is. Is it Christmas yet? I almost can't stand the anticipation! In addition to this gift, we got him a few smaller items to open and be used as stocking stuffers. Since Tap Tap Bang Bang was a book loaned to us by the library, we were sure to pick that up. In keeping with the theme, we also ordered the book Tools Rule!. Another library favorite has been the movie Lost and Found. Our family enjoys this sweet and simple story, and Benjamin will be happy to add it to our permanent collection. The entire family actually keeps wishlists year around on Amazon -- they make it really easy to update and share with friends and family who request it. I keep a growing list of books, tot school supplies, and toys I think that Benjamin would enjoy. Since he loves to sing and dance, we decided to get two of the CDs on his list, to add to his stocking. Those were Sunday School Songs by Songs Kids Love to Sing and Sing Along with Putumayo. 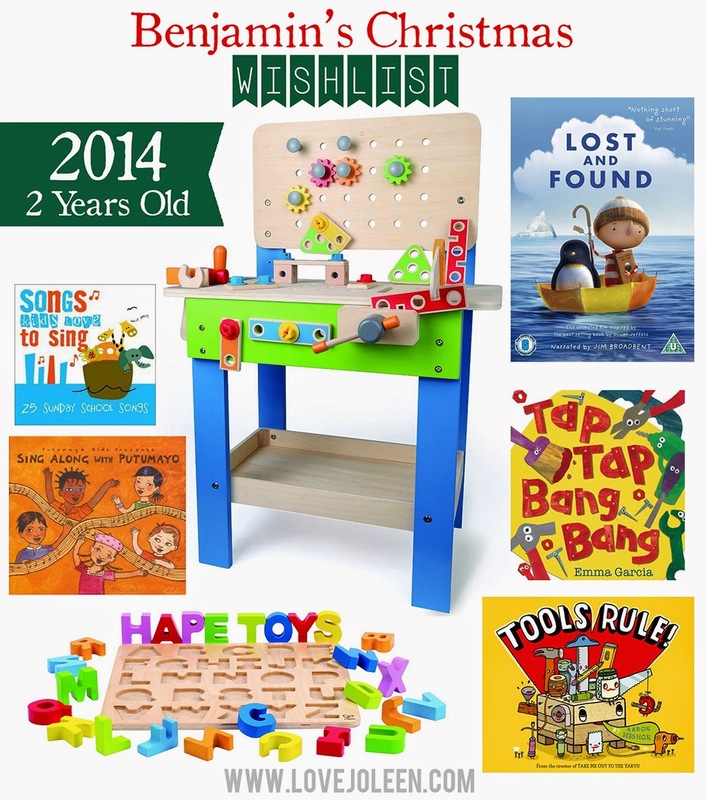 The last gift we ordered was the Hape Alphabet Puzzle, which I've been wanting to get for the longest! Benjamin enjoys puzzles and it will be great for him, while he's mastering the alphabet. All that's left to figure out for this year is his stocking. I think just a couple more items -- maybe some new play dough and a couple of handmade gift ideas I've been considering making. Do you have any great toddler-friendly stocking stuffer ideas? I'd love to hear them!